A parent’s job is never done. The American Academy of Pediatrics recommends that parents and caregivers start reading to their babies as early as possible. We know that this may not be easy, especially if you already are physically exhausted. However, you can make reading to your baby one of the best parts of your day. It’s a time when you can sit down (BONUS!) and just enjoy your time with your baby. Best of all, just the simple act of reading to your baby can add huge benefits to your child’s development. Why is Reading to Your Baby Important? Bonding time together where you get to snuggle and cuddle. Stimulation where your baby gets to see your face, hear your voice, feel your physical closeness, look at the book and interact with it. Develop attention span, focus and patience. Build up memory skills, especially if your child learns the words. Aid in language development and increase the number of vocabulary words that your baby hears. Useful to establish a stable routine before bedtime. Introduce an early understanding of how our world works. A convenient way to teach about pictures, colors, shapes, concepts, morals, ideas etc. There are many types of storybooks out there. Some are great for babies, some are not. It’s important to choose the right kind of books for your baby’s particular phase of development as this may impact both you and your baby’s enjoyment of reading time together. For example, if you choose a book with thin paper pages, you will find yourself frequently trying to release your baby’s curious but deadly grasp on the pages as he or she tries to explore the book. If your baby is especially feisty, he or she will happily tear those pages. Some babies will try to put the cover of the book or pages in their mouth and gum them until they ultimately are destroyed. 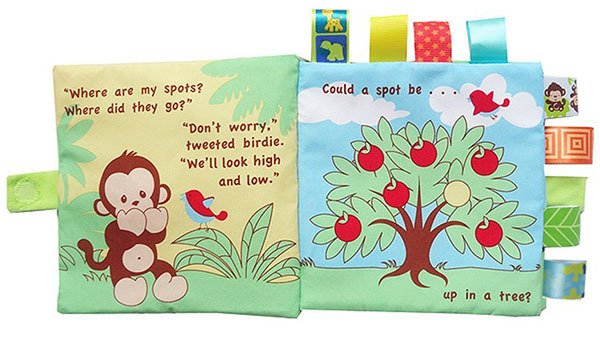 For very young babies, soft books are generally better. Not only are soft books lighter so that it’s easier for your baby to pick up, but the softness of the book will reduce the likelihood of your baby hitting themselves with the book. It’s also better for sucking as opposed to a paper-based book where even the thickest and toughest board books will eventually deteriorate with extended sucking. Plus, after all that sucking, you can plop the cloth book into your washing machine for a good wash.
Have lots of colorful pictures. Don’t have too many words on one page as your baby will constantly be trying to turn the page. Books are short and sweet as babies don’t have a long attention span. 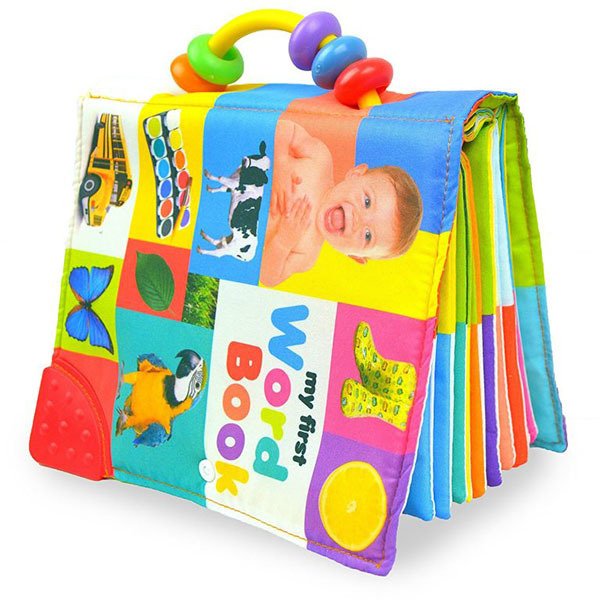 Encourages tactile stimulation such as cloth flaps to flip over, different textures within the book such as crinkle pages, soft toys to touch etc. If there are attachments such as buttons, string or beads, they are sewn on very securely to the book. Otherwise, these would pose a choking hazard if ripped off. Soft books are great for any baby but they are limited in numbers and supply. To extend your child’s reading library, hard books are great for babies too, especially if they have sufficient finger and hand strength to start holding these books themselves. Thick cardboard pages that will allow baby to turn them more easily and not skip too many pages at once. Still have lots of colorful pictures. Still don’t have too many words on one page. Books are still short and sweet but could go a bit longer. 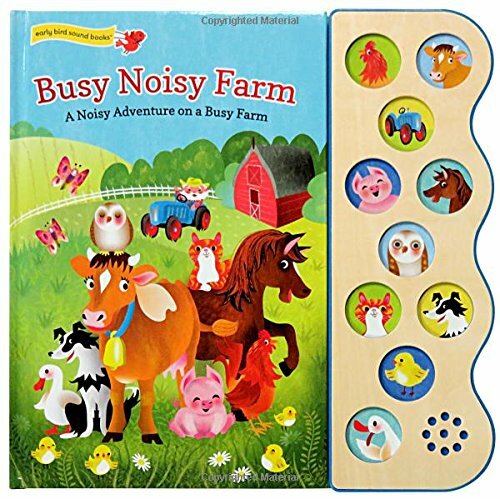 Encourages tactile stimulation such as flaps to flip over, different textures within the book, soft toys to touch, gears to turn etc. Beware that some flaps are designed better than others- those that flip open easily are less likely to be ripped off the book. 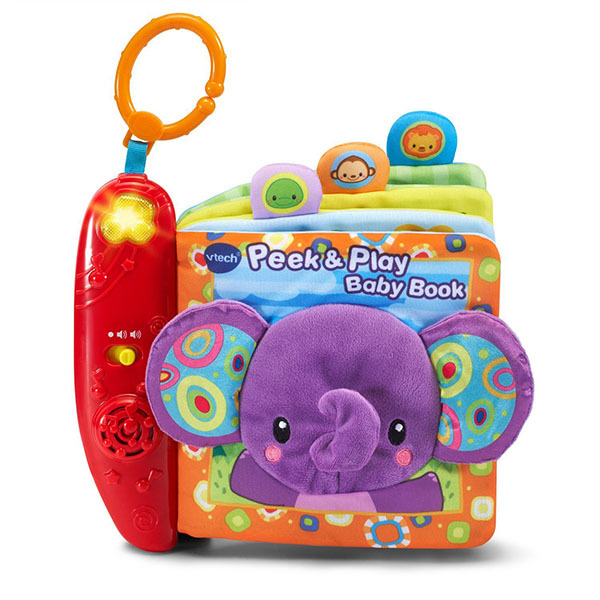 Battery-operated books may have flashing lights, play short music or rhymes that you can sing along to. The best books for babies are interactive. Books that stimulate sensory and motor development, play music or allow you to interact with your baby while you read are great. For example, a book that requires you to make animal noises while you read, sing a nursery rhyme, flip open flaps or touch and feel books. 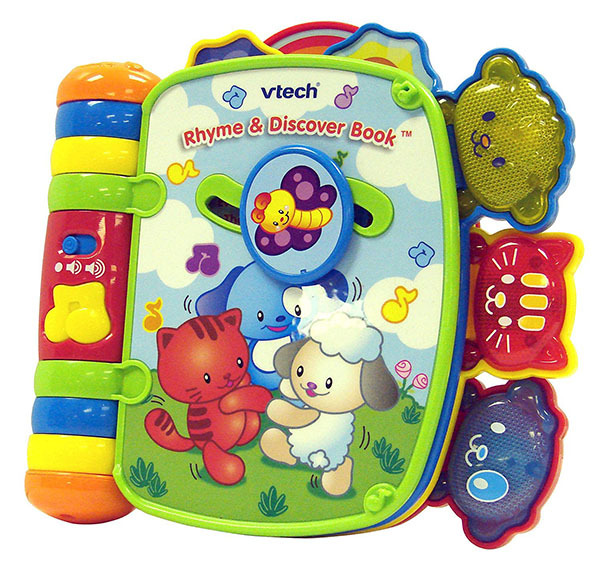 This VTech Baby Book is a soft book that has been designed very well to be used in your home or on-the-go. It has a plastic ring on a string attached to the book that allows you to hang this book on your car seat or stroller. 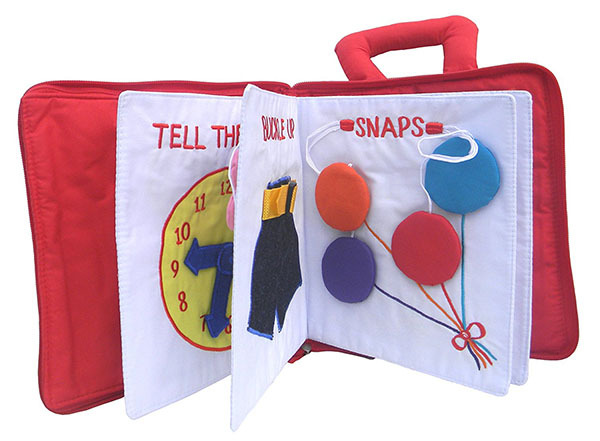 This is great for 2 reasons- you don’t have to worry about your baby throwing it out of the car seat or stroller and second, you can hang the book up so that it becomes a batting toy for your baby and can help with the development of spatial awareness. The pictures in the book are very colorful and there is a soft elephant on the cover to touch. The theme of the book is mainly about daily life- eating and taking a bath. This book plays a different tune on each page when a tab is pressed. There is also a button to turn on the music, as well as to adjust the volume of music. In addition, there are fabric doors to open and close and a mirror. We absolutely ADORE this book. It’s a cloth activity book but it’s not just for young babies. It’s designed so that an older toddler could still find a lot of value in it. It’s especially great for tactile, sensory and fine motor skill development. There are snaps to take off, a clock’s hand to move around, buttons to undo, shoelaces to tie or untie, belt to buckle and dress to zip. Just normal everyday things that you will need to teach your child anyway. Last but not least, it looks handmade, which makes it even cuter! Melissa & Doug Soft Activity Baby Book – The Wonderful World of Peekaboo! 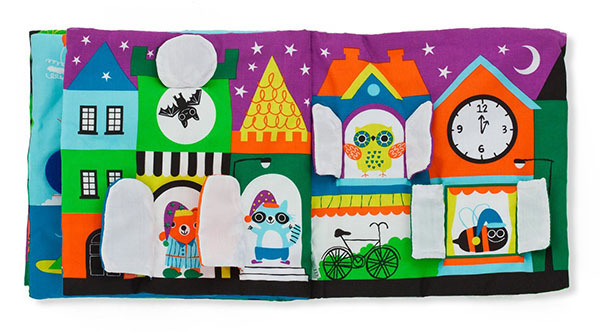 This Baby Book is a soft book that incorporates a variety of imaginative scenes. For example, imagine rockets, hot air balloons, rainbows, kites and bees all on the same page? Each scene has 5 or more peek-a-boo animals. The pages are also multi-textured with crinkly flaps for your child to open. 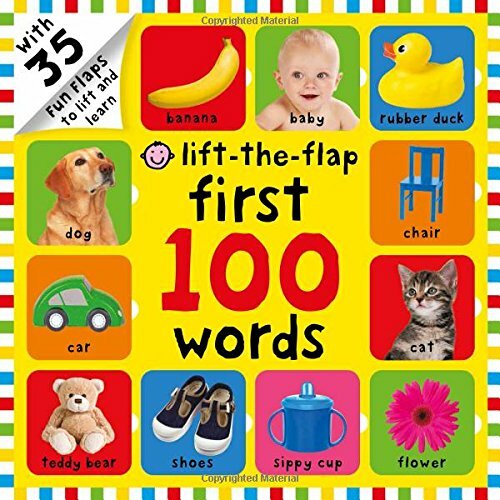 This is a great starter book for young babies to learn their first words. 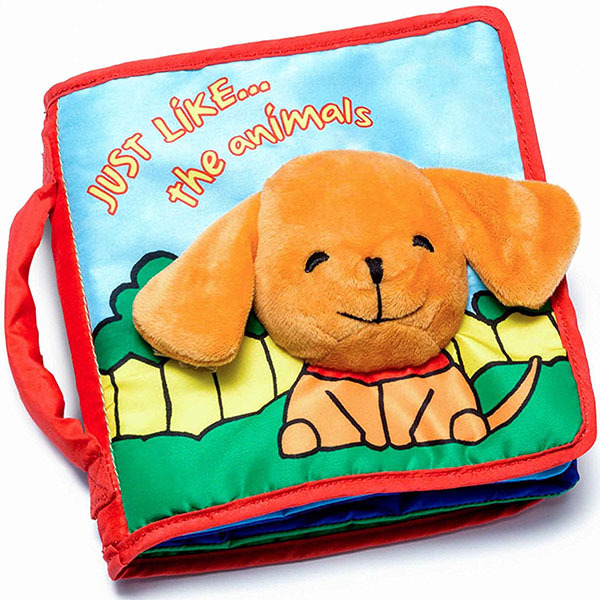 Made of cloth and bright, beautiful colors, this book has pictures and words for animals, food, colors, vehicles, toys, clothes, and daily life. We especially like the plastic handle of the book that has 5 colorful, moveable beads on them. The corner of the cover has a plastic chewing piece. 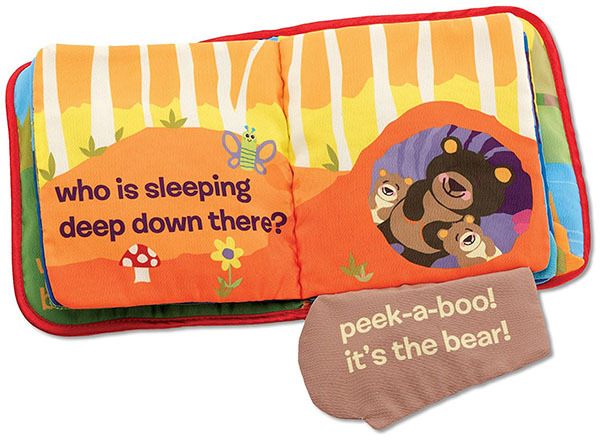 The Lamaze Peek-A-Boo Forest has 6 colorful soft pages, cute pictures and multiple textures. Unlike most of the other soft books, this book uses rhymes to tell its story. The story is simple but engaging with crinkly flaps and an animal on each page. 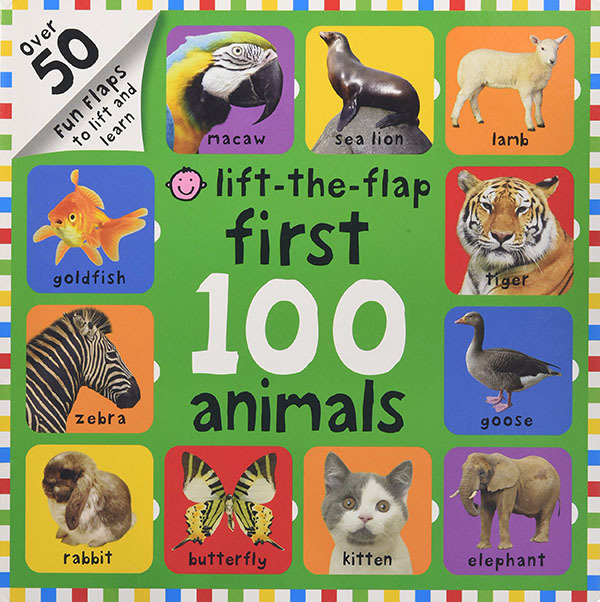 Like the other soft books mentioned in this list, the book features cute animals, bright colors and multiple textures. But there is an additional feature in this book that we like a lot- finger holes so that you can slip your fingers in and make the animals look like they are moving. If you are planning on giving this as a gift to someone else, it also comes in a nice-looking, luxury box. 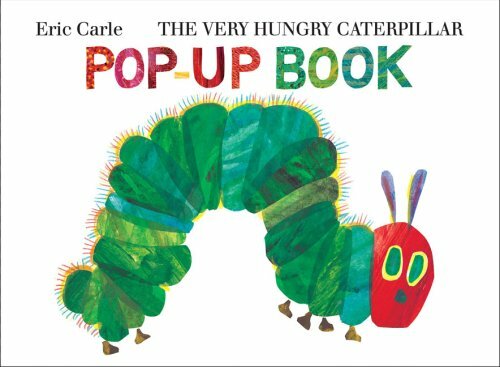 This book by Eric Carle is a classic but they have managed to make the book even better by making it a book with sliding windows. 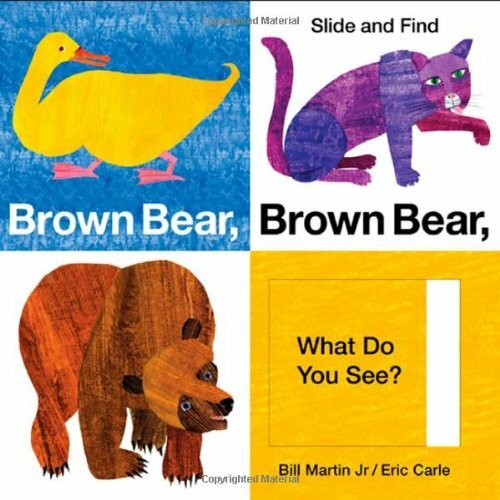 Not only can you introduce the concepts of colors and animals to your baby in this book, when your baby is ready, he or she will enjoy sliding the windows open and close to reveal the next creature in the book. The Very Hungry Caterpillar is another classic book by Eric Carle. It features a little caterpillar that eats its way through good food as well as ‘bad food.’ In the end, it transforms into a beautiful butterfly. What is super cool about this pop-up version, is that the food in the book are now all pop-up. We realize that this book won’t be ideal for young babies that cannot help but destroy fragile items but it is so beautifully done that we had to mention this book. The butterfly at the end is also a wonder to behold. This board book encourages fine motor skills and teaches about cause and effect. It has sliders on every page that your baby will find intriguing and want to interact with. 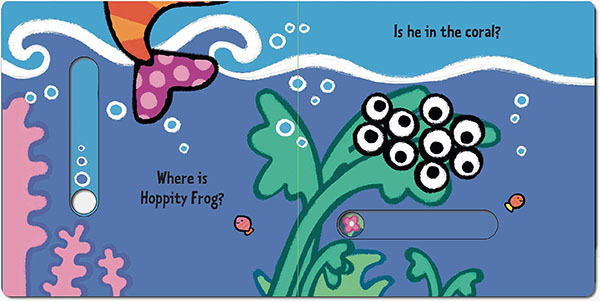 The theme of the book is mainly water-loving animals. This book is a great book for introducing literacy early to your baby. It contains 100 common words that your baby is likely to come into contact with and has colorful pictures. It uses flaps to make the book more interactive for your baby. This book is great for introducing animal names to your baby. It also comes in a lift-the-flap style to increase interactivity and promote more engagement. This battery-run book incorporates a whole host of sounds including animal sounds in its story. Your baby will get to press the buttons to make the sounds go. The story is about a farmer that rides his tractor around the farm to look for his missing pig. On the way, he will come across other animals like the cow, rooster, dog and horse (10 animals in total). The pages are thick which make it easier to turn for babies. This interactive battery-run book is an amazing book and perfect for babies who love music. It is colorful and has tons of activities. 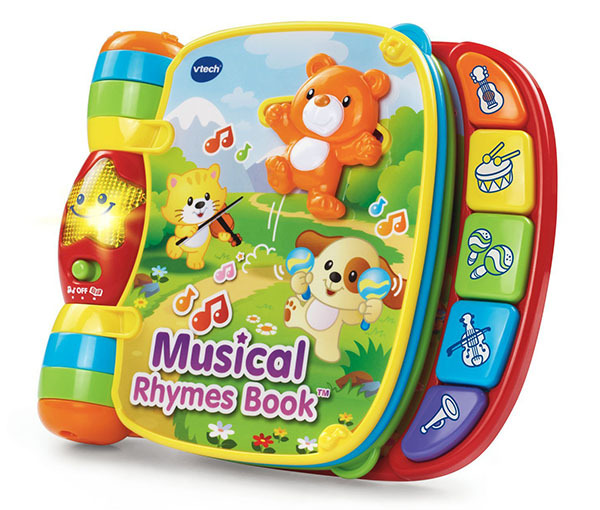 It has 6 pages, plays 40+ songs/phrases including popular nursery rhymes such as Old McDonald, Here We Go Round the Mulberry Bush, Are You Sleeping, Hey Diddle Diddle and other musical instrument sounds. Expect to find yourself singing along to the music- your baby will love it! It also has parts where your baby can slide and twist, a light-up star and 5 piano-like buttons for honing your baby’s fine motor skills. The volume is adjustable too. Plus, the plastic is BPA-free. This is another awesome interactive book by VTech. Just like the other VTech book recommended above, this book plays tons of music, is colorful and highly interactive. It plays 7 nursery rhymes, 20 different songs, sounds and phrases, has 4 movable pieces and also twinkling lights. The book is BPA-free. 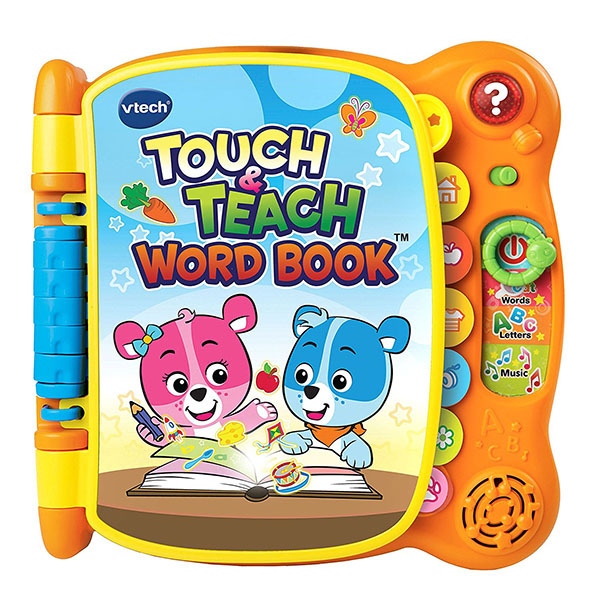 VTech churns out another super interactive book with this VTech Touch & Teach Word Book. This time, this battery-operated book introduces the ABCs and over 100 common words to your baby. Like the other VTech books, this book comes with sounds and music which is great for babies who love music. There is a slider on the right that allows your baby to change the play mode of the book from words to letters to music. So many, many great interactive books for your baby. Books are one of those things that you can never get enough of. Happy reading!